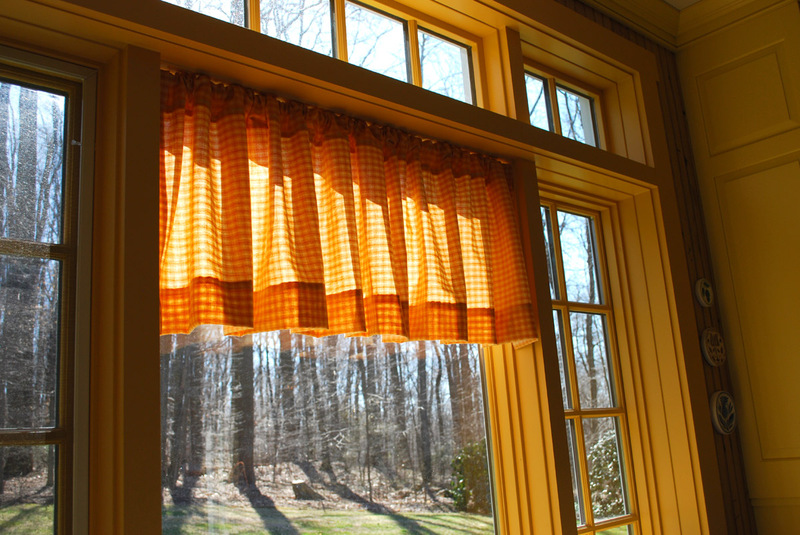 I made a curtain valance for over the kitchen sink. The morning sun shines brightly through the leafless trees. Since this tip is briefly mentioned in general writing-helps – if mentioned at all – I’m highlighting it here. It’s one of those little things in life, easily overlooked, so it's given less credit than it deserves. If writing is an exercise in black and white, how do we convey what we want to say in black and white and appeal to the imagination? The most direct way of doing this is to add color-words. Color-words are the simplest of all the sensory languages. I find color-words to be a natural, easy-going way to engage imagination. Color is part of our beauty-sense. 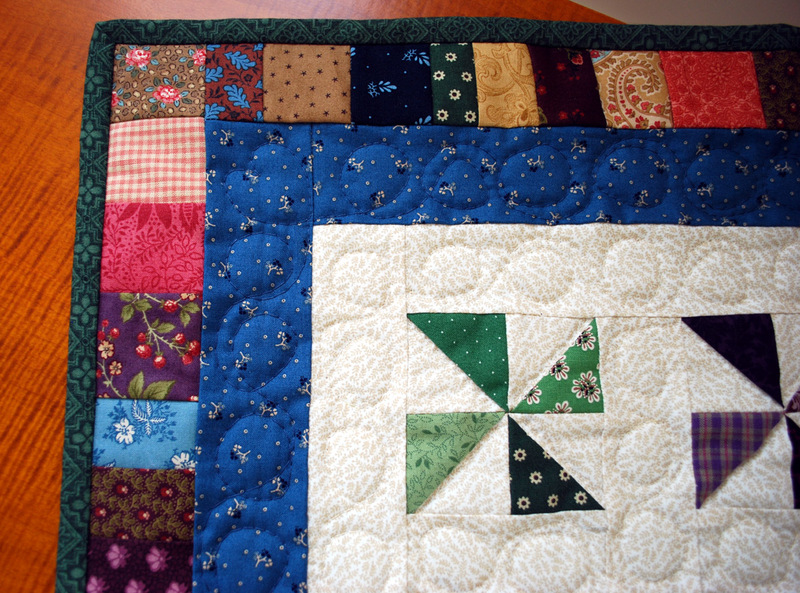 Make a quilt using colorful scraps from former quilt projects - was the challenge I took up over winter. A writer has a pool of experience. Drawing upon her sense-experience she describes what she has seen, felt, smelled and tasted. Color-words find a happy home in fiction and non-fiction alike. In Mother Culture (a collection of essays) I seek to bring intangible ideas to life by drawing upon my sense-experience. It occurred to me, only recently, that Mother Culture uses color-words freely. In fact, when I went back and flipped through the pages – with a mind to share this tip with you today – I found every color in the rainbow. These colors are straightforward; not fancy oil painting colors (although I do like the names of these). This is what I like about color-words. They engage the imagination of the reader without detracting from the main ideas of the essay. This isn’t any hard-n-fast rule. It’s just my idiosyncratic opinion. I know some of you enjoy writing a blog and might welcome the occasional tip, while your own special writing-style is developing to your liking.
. . . he knows something more about it than just its yellow color. 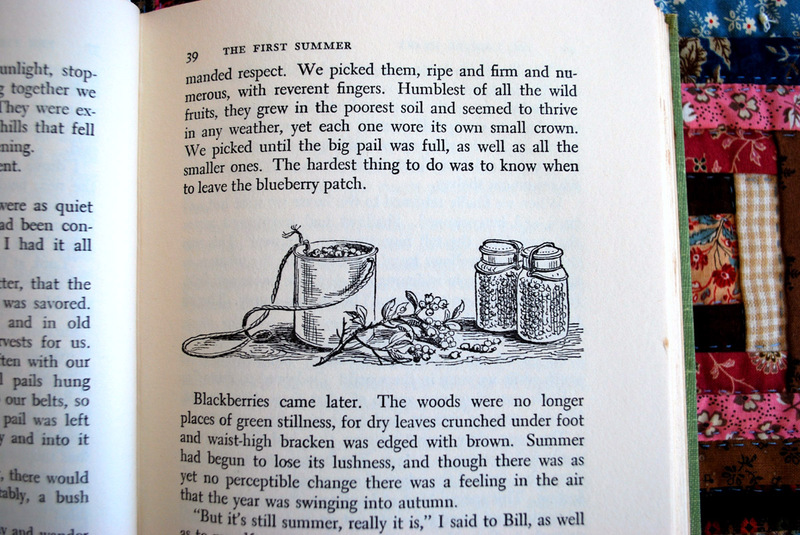 p 57 (referring to a dandelion). 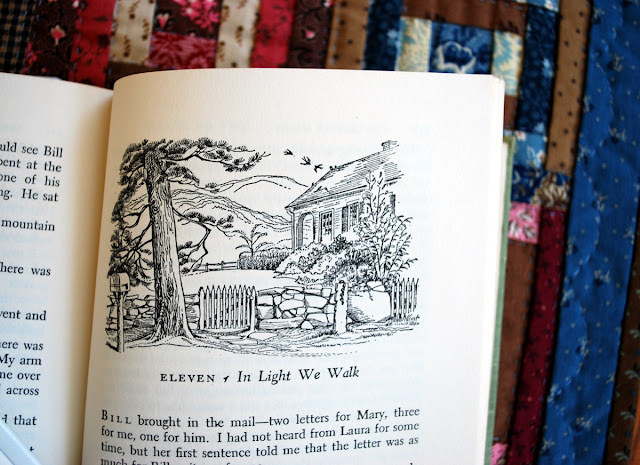 This winter I read The Lighted Heart (1960) by Elizabeth Yates (1905-2001). I Elizabeth Yates so I thought I'd give this one a try. I happily found it to be a story of rare sweetness. I savored its peacefulness in the face of its frightening disappointment. After ten years of doing business in the city of London, an American couple, Bill and Elizabeth (in chapter one) move to rural New England. 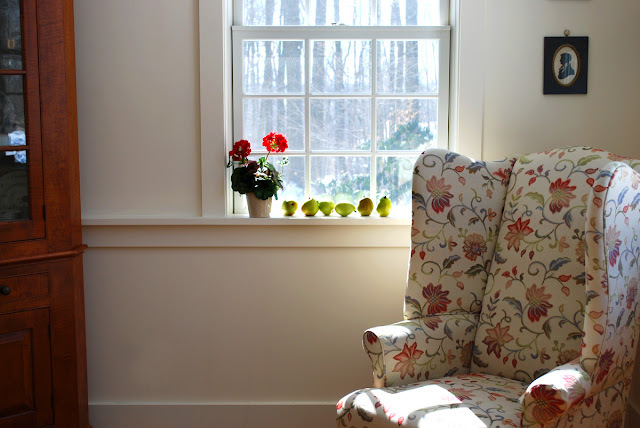 They find the antique house and farm of their dreams, near a country village. They have no children, but they do have some companionable dogs and friends. Elizabeth tells the story. It takes place over a handful of years and follows nature’s four seasons. Then the frightening disappointment befalls them. Bill loses his eyesight. They meet this tragedy with courage. Because of a diagnosis he was given in earlier years Bill and Elizabeth knew it was an eventuality. While this couple adjusts to their new life together, Elizabeth tends a large vegetable garden. Humorously, she explores different ways to cook squash. She also takes up writing so they can butter their bread. As Bill learns necessary skills, his wife reads everything she can find in the local library about living with a blind person. The value of this easy-to-read tale is the warm relationship shared between husband and wife. Theirs is an enduring love. “How do they do it?” I asked as I closed the book. In answer to this, an ideal I’ve found to be a very high ideal indeed, from the Word of God, entered my mind. Here we have two people who give the other precedence. Each, in humility, counts the other more significant than himself/herself. (Philippians 2:3) Isn’t this what true love is? 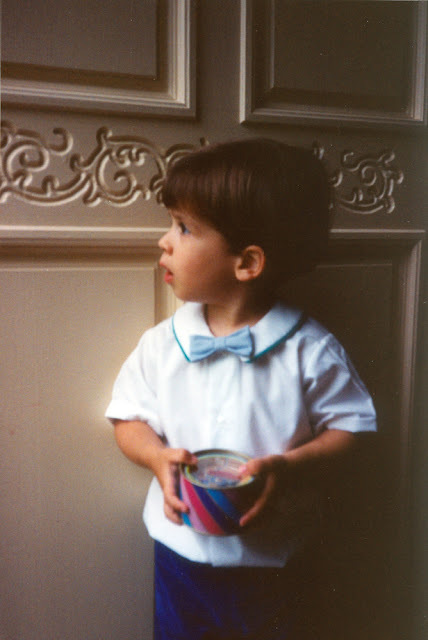 Dear Cheryl, you can see how I’ve been using your gift to me of a green basket. Could you ever have guessed such a use? Dear Mrs. Sharon White, uplifting and gentle Christian homemaking advice embodies your writings. I feel honored that you featured Mother Culture on your blog: The Legacy of Home. Your testimony of the positive influence of a wife, mother, homemaker, is encouraging. I feel myself rising out of a domestic slump when there. 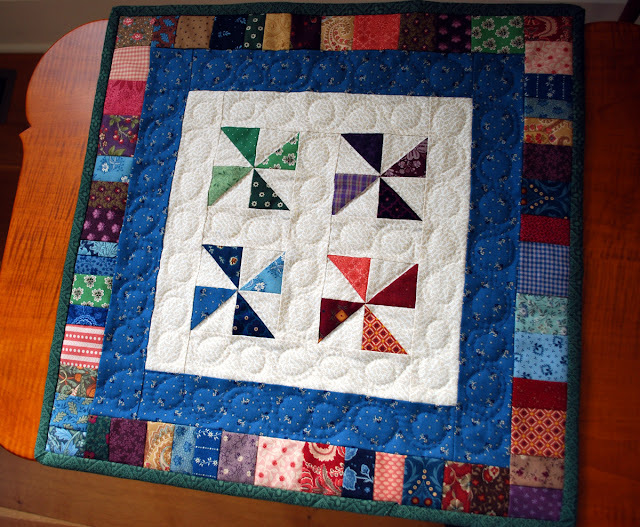 Therefore, I can invite my blog friends with confidence to visit you in the blog neighborhood. Your offerings are generous and inspiring. Many thanks, dear Brenda, for including Mother Culture among your on-going book reviews. I am impressed with your fondness for books and am amazed at how quickly you devour them. Your bog friends can never be in want of suggestions at Coffee Tea Books and Me. A stack of blue quilt squares and a stack of red (Courthouse Steps) yet to be sewn together to top a dresser. The Lighted Heart, on Amazon. Thank you for visiting here today. Comments are Welcome. Whenever I come across a mom who is ministering the ideas of Mother Culture online, my heart is warmed. I’m happy to see the ideas welcomed. We home teachers have weighty cares. Endurance is needed for our long hours of service. 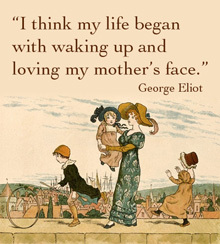 But moments of Mother Culture are refreshment along the way. 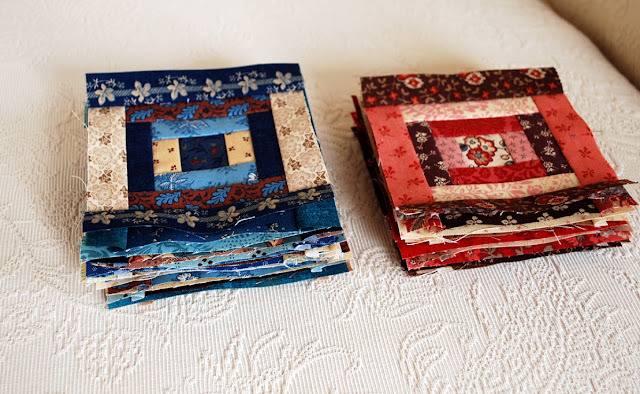 A glass of ice tea, ten minutes with an embroidery needle or paint brush, a few lines written in a journal, a stroll in the garden, a prayer while folding the towels or making a bed, are calming interludes. Mother Culture bubbled over in my magazine 1993. “Hmmm, this looks interesting,” I thought. 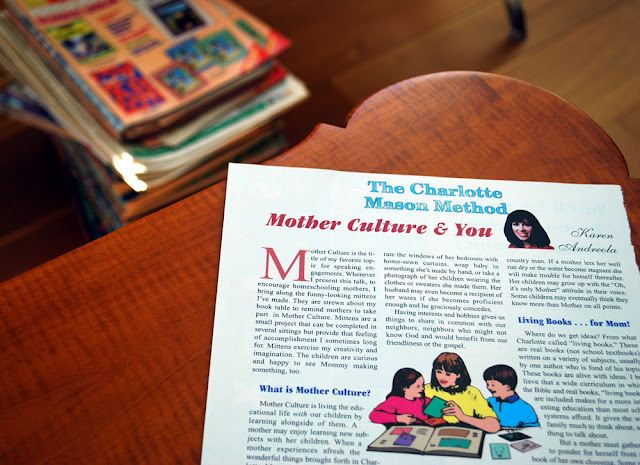 It was the article “Mother Culture,” an article that had been buried in the archives for a century, used for the first and last time in 1892 in reference to parenting . . . until the day it caught my eye. It gives me goosebumps to think of it. I remember how little my children were. I remember which house we were renting. I remember how impressed I was by this anonymously written article. Even the title struck a chord in my heart. Nigel, the baby of the family, turns age 30 this April. Oh, my. Over the next 26 years I would continue to revive, expand, and introduce Mother Culture to a new generation. 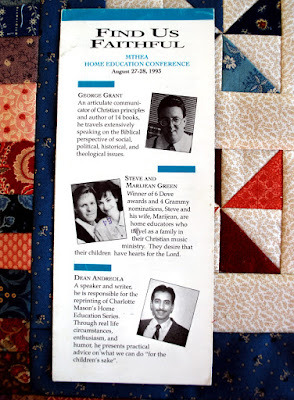 Dean spoke on Charlotte Mason as early as 1993,. Greatly sympathizing with my fellow home teachers, I put effort into promoting Mother Culture wherever I was asked to speak. I was a nervous and shy speaker. (I still am.) My soft voice doesn’t project well or record well. But because I sensed Providence had given me something important to say, I rose to the challenge. 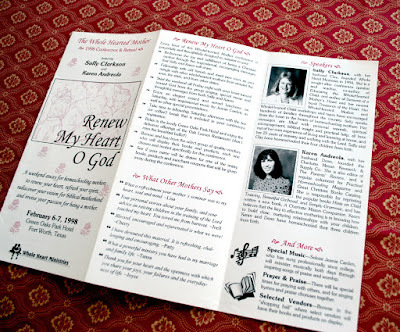 I spoke at retreats, to small groups at public libraries, in churches, private homes, my own living room, even on the radio, gladly, without honorarium. Eventually, Dean and I were invited to introduce the ideas of Charlotte Mason across America as professional keynote speakers. 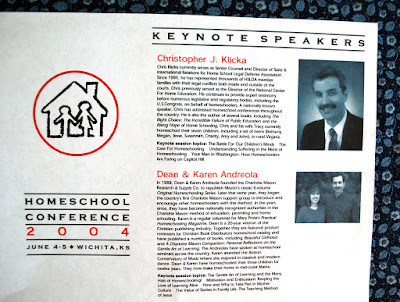 We have fond memories of sharing supper with Chris Klicka several times. When we did, I also gave a talk on Mother Culture. Audiences at these state conferences grew bigger and bigger. Really a homebody, I remember telling Dean, in Florida, when I peeked into an auditorium filled with thousands of people, “Where am I? What am I doing here?” With trembling fingers, I held tightly onto my notes. 1998 was a busy year. 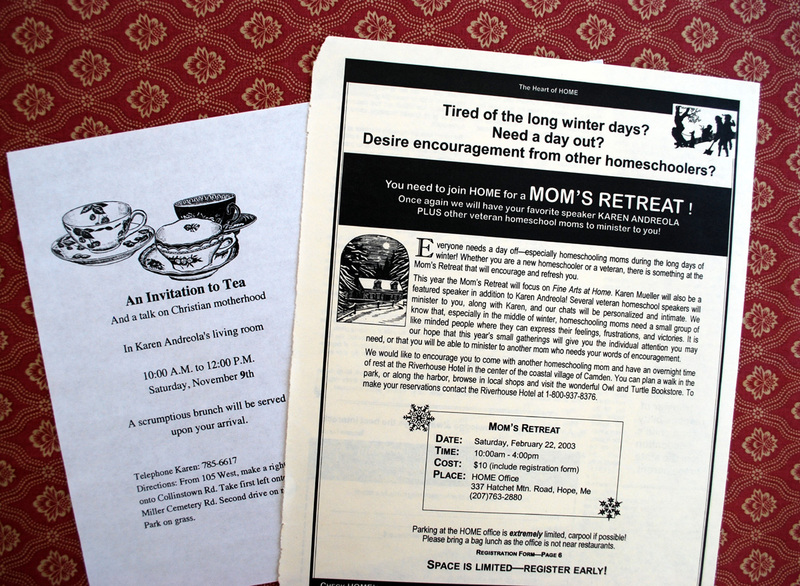 Our children enjoyed the Sandy Cove family conference at they did other family HS retreats. 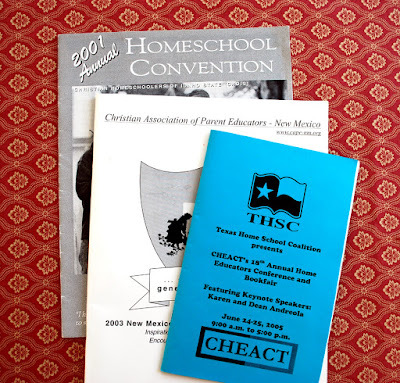 Mary Pride, editor of Practical Homeschooling Magazine, invited me to be a columnist. 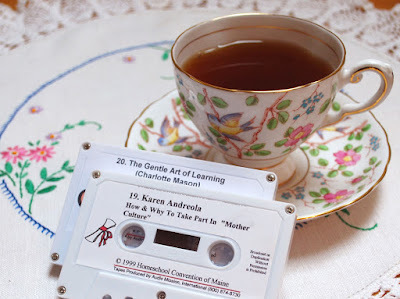 My column was dedicated to the Charlotte Mason Method. 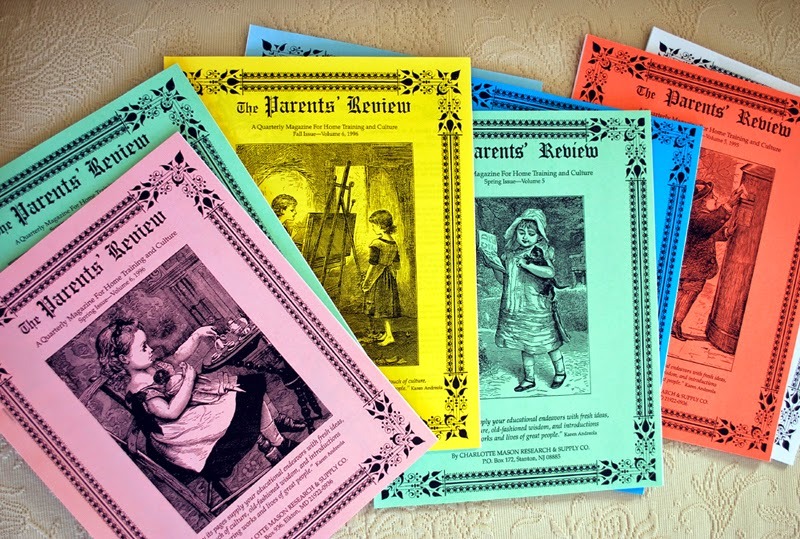 (We advertised and sold Miss Mason’s “pink” books through the magazine). 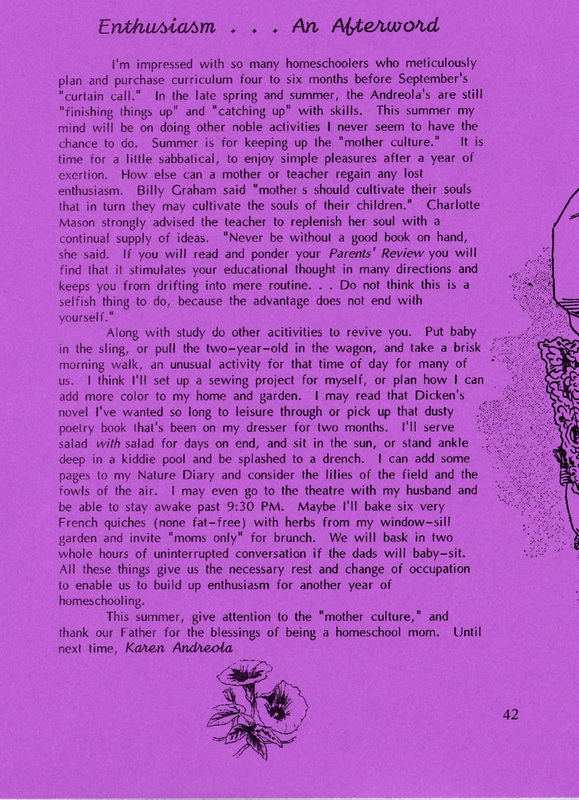 Here you see the first page of one of two articles I wrote on the advantages of Mother Culture. The time was ripe for a book. 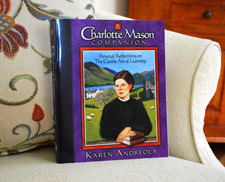 Endeavoring to paint a picture of what home education can look like, A Charlotte Mason Companion was born (1998). 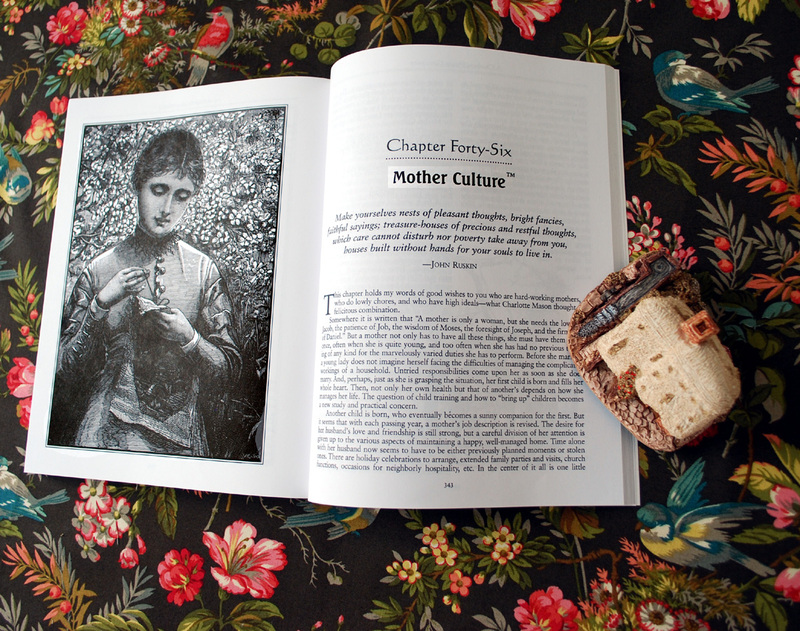 I found Mother Culture a good remedy for preventing burn-out so I decided to turn it into a chapter, too. 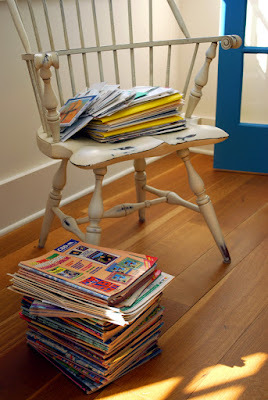 Blogs, websites, podcasts and tutorials were not widely in use, so a book was still the best way to share a collection of ideas. Chapter 46 of A Charlotte Mason Companion, 1998. In 1999 Dean and I were contacted by CBD to write freelance reviews for their printed catalog. 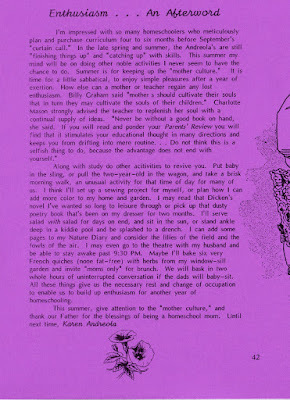 That year I suggested a special feature devoted to Mother Culture. CBD liked the idea. I set to work arranging it, picking out books and writing up the reviews for what I had found helpful in keeping up my own Mother Culture. 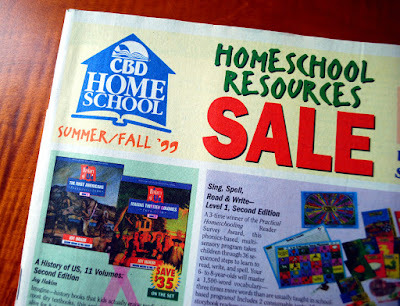 The catalog was read far and wide. It would reach more readers than A Charlotte Mason Companion. Years later, my son would do the graphics for my CD. 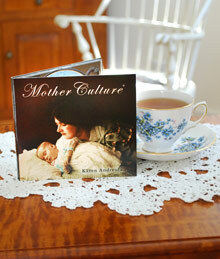 This live conference talk on Mother Culture® (2004) is now accessible FREE on YouTube. 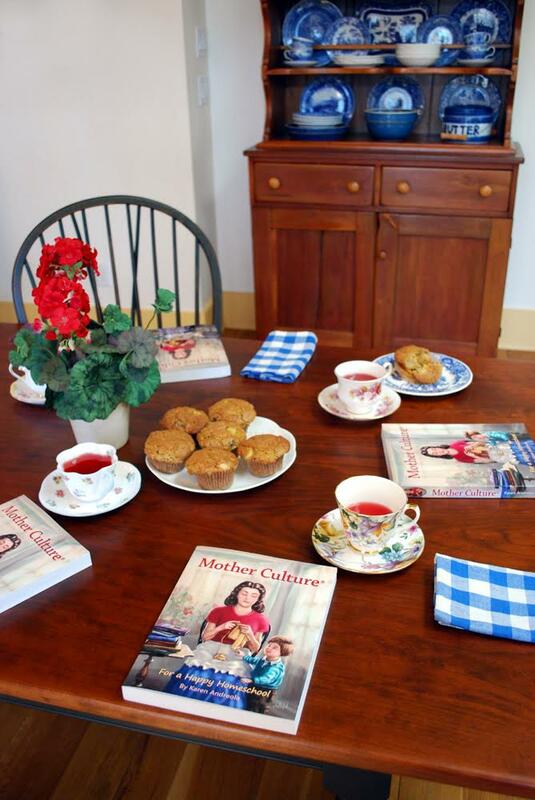 So you can see, for quite some time, I’ve been busy popularizing Mother Culture publicly through: articles, books, speaking engagements, catalog product reviews, 10 years of blogging - and lately - mini-articles on Facebook. Phew. 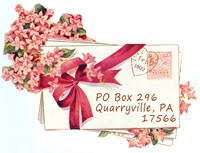 Privately, I’ve answered hundreds of letters over the years from moms who have questions or wish to connect with a kindred spirit. Here’s a flash back. I remember sitting in a lounge chair, on green grass, under a shade tree, while my little ones were splashing in the puddle pool and digging in the sandbox. On such a summer afternoon, I might have a large plastic zip-lock bag of letters to answer. 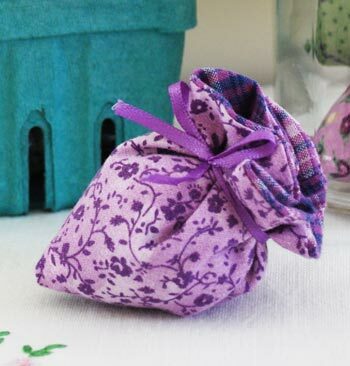 (I had learned from experience the necessity of a zip-lock bag during outdoor playtime, he, he.) With pen in my hand, a prayer on my heart, I attempted to confide and encourage. In time, paper letters dwindled. Emails took their place. Today questions mostly come through Facebook messenger. I wish I could have a chat in person with these conscientious mothers. Understanding their apprehension and stress, I pray the Lord uses what little I am able to convey by FB messenger. It can only be a small help in light of the weighty cares that are carried on feminine shoulders. If I link to an applicable article, I make sure to link just one. I discern internet-information-overload and the “not-enough syndrome.” These steal away peace. 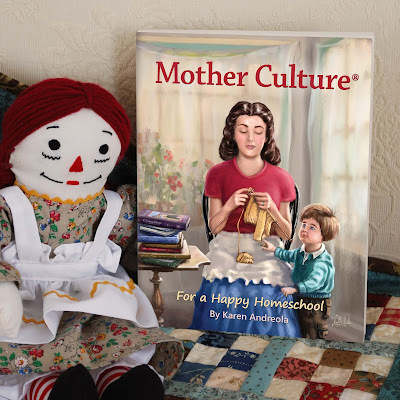 With carefully chosen words, I address apprehensions in my new book, Mother Culture. Stuff was piled on the parlor sofa, floor, and chairs. 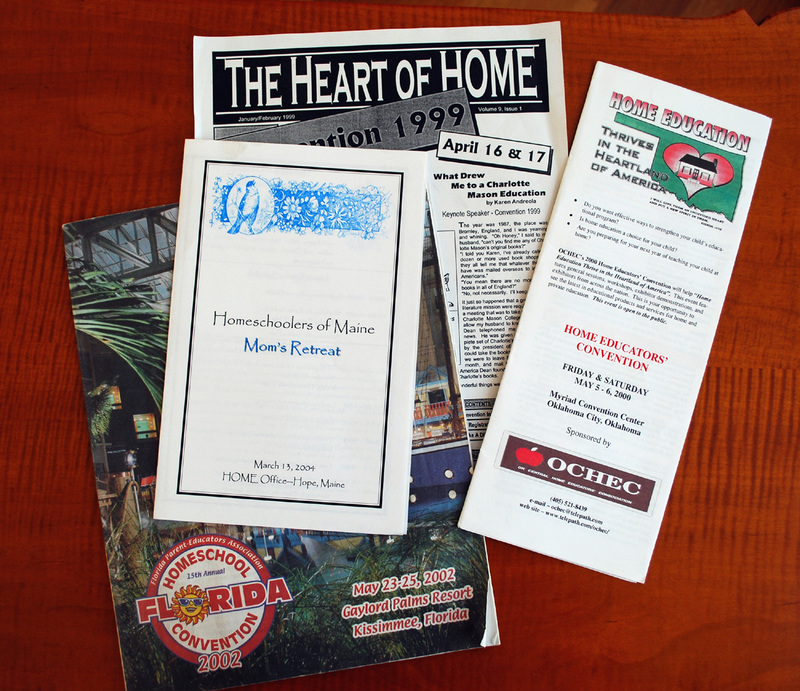 To my chagrin the little room took on the clutter of catalogs (Dean saved at least one of each issue that featured our reviews), old brochures, and paper correspondence. He has kept all this paper not because he is a pack-rat (although he does tend to collect) but moreover because in business you are required to show evidence of your brand. 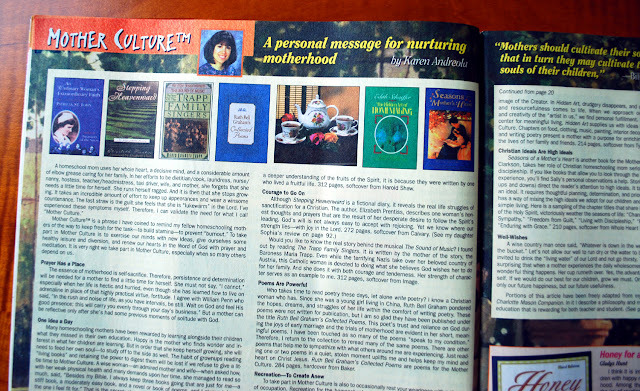 Mother Culture® became so entwined with my work and ministry that I filed for the trademark in the year 2000. That’s why you see the “R” next to it – like so many items at the grocery store. This does not prohibit people from using the term Mother Culture in conversation. We hope it sparks enthusiastic discussion within lively forums, study groups, and blogs. The business trademark simply reserves Mother Culture® as a title and exclusive brand-name for goods, books, services, websites, ebooks, lectures, etc. My writing represents my life. It is part of our livelihood and pays my high medical insurance/expenses, tax, food, etc. Thank you for your patronage. It’s been an honor to serve you. 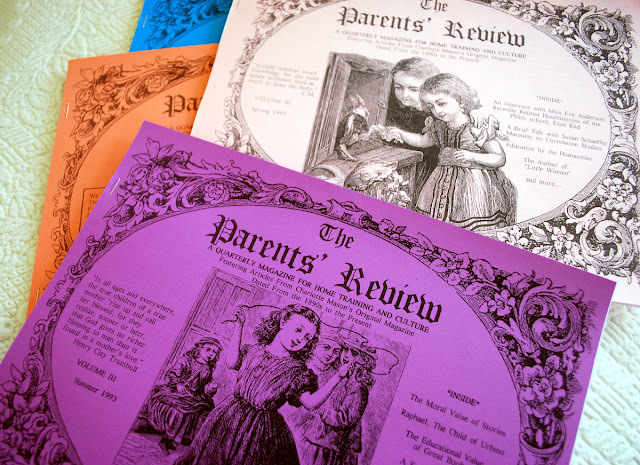 The original Mother Culture article (1892 Parents’ Review) is commonly linked by bloggers as an online reference without mention or knowledge of Karen’s origin-story. 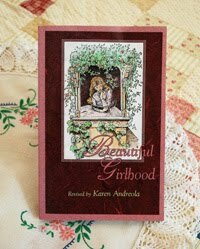 Yet, had it not been for Karen Andreola - Mother Culture as we know it today - might have gone undiscovered for perhaps another 100 years. Pears ripening in the sun. 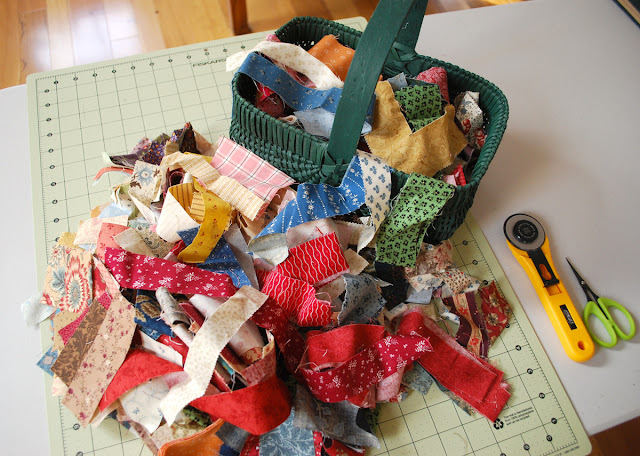 Getting the parlor tidy again. 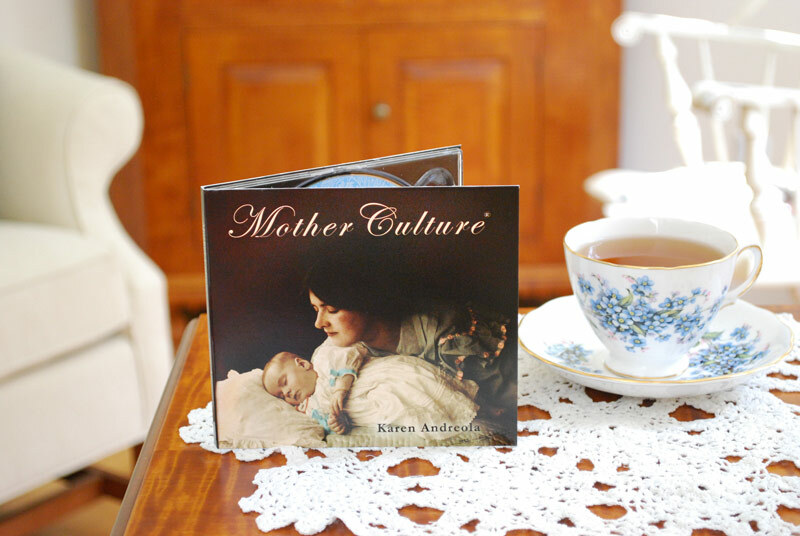 Amazon placed an order for Mother Culture.® Therefore, it is in stock. It is also sold at ChristianBook (CBD), Simply Charlotte Mason, Grace & Truth Books. 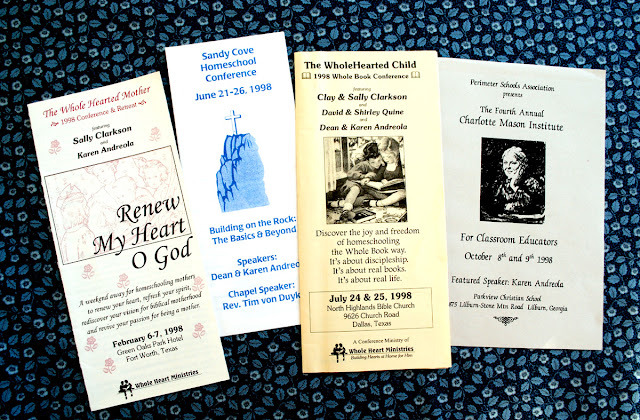 In Canada: Maple Tree Publications, The Learning House, and Heritage Resources. In South Africa: Cubits Kids Edu. 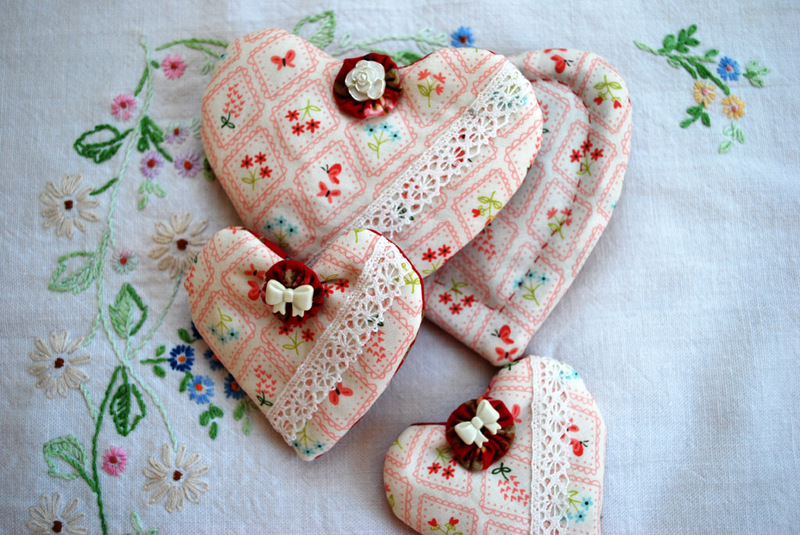 My sachets have batting but are flat enough to mail in a padded envelope to friends. 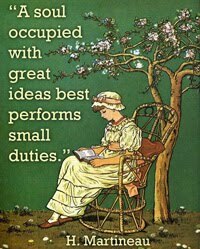 I like this quote by Virginia Woolf. Can you relate to her hyperbole? I was visiting my married daughter, Sophia, for a week. One day we set out by ourselves to a secondhand book store. Dad was home with the children. The book store is a grand place. So grand, we didn’t have time to scour all its shelves. Instead, we sauntered a few narrow aisles, and zoned-out peacefully. The shelves were packed to overflowing. They were dusty and a bit messy, which gave them a sad appearance. While browsing the homeless books in the sad aisles, I couldn’t resist tidying the shelves as I went. Then, my hand gingerly gasped an antique. It was handsomely bound and more than a hundred years old (here pictured.) I was surprised it was not behind glass, lock and key. 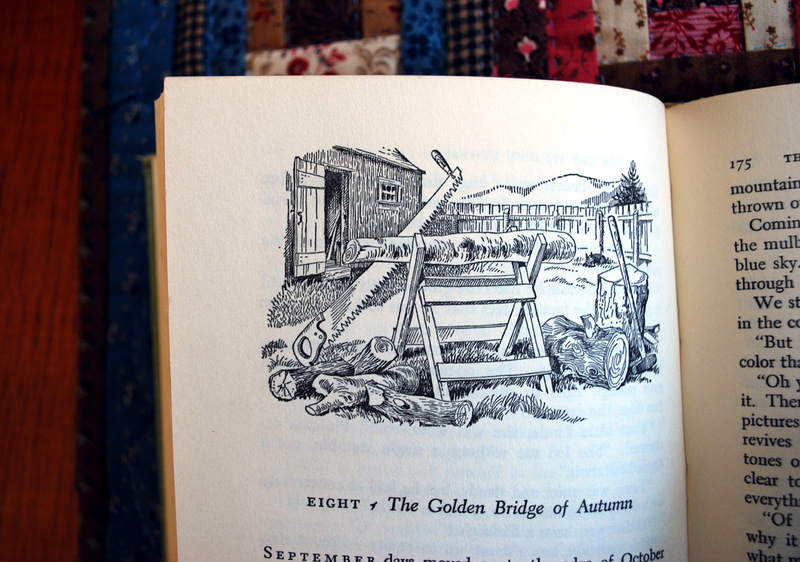 I stood turning the yellowed pages in low light. The print was faded but legible, the sentences a treat. A minute later Near to Nature’s Heart by Rev. E. P. Roe was being cradled it my arm like a newborn baby. This was the beginning of a friendship. What was responsible for this meeting of a “complete stranger” - to use the words of Virginia Woolf? The title; it respects nature. The author; he respects God. The Christian viewpoint of Near to Nature’s Heart drew forth my deep sympathy. Rev. Edward Payson Roe (1838-1888) was an (old school) Presbyterian minister. A main character, Saville, is an army officer in the Revolutionary War, 1776, fighting the red-coats. Published 1876, this story was a fitting resource to celebrate America’s Centennial. (George Washington and his Bible have parts to play in it.) Because the author was a chaplain in the Civil War, his skirmishes were probably written with first-hand knowledge. This gives the story a masculine-feel. But hang on. 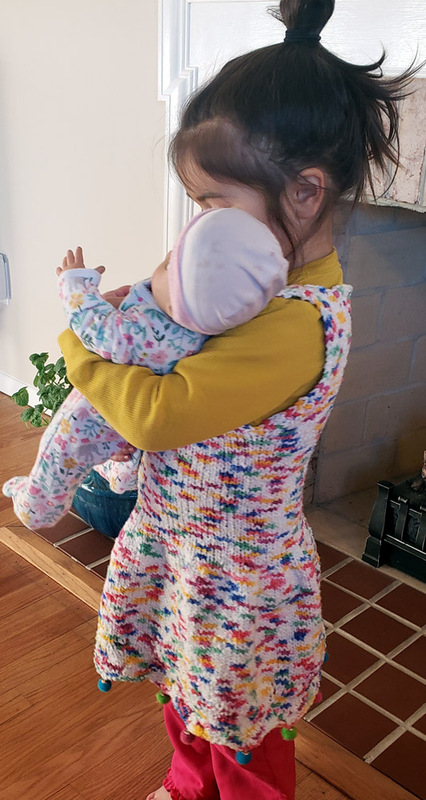 I knit this jumper for Eloise in cotton silk. Saville crosses paths with the family as the cabin is not far from the military fort on the Hudson. He is concerned for their safety but keeps their whereabouts a secret. 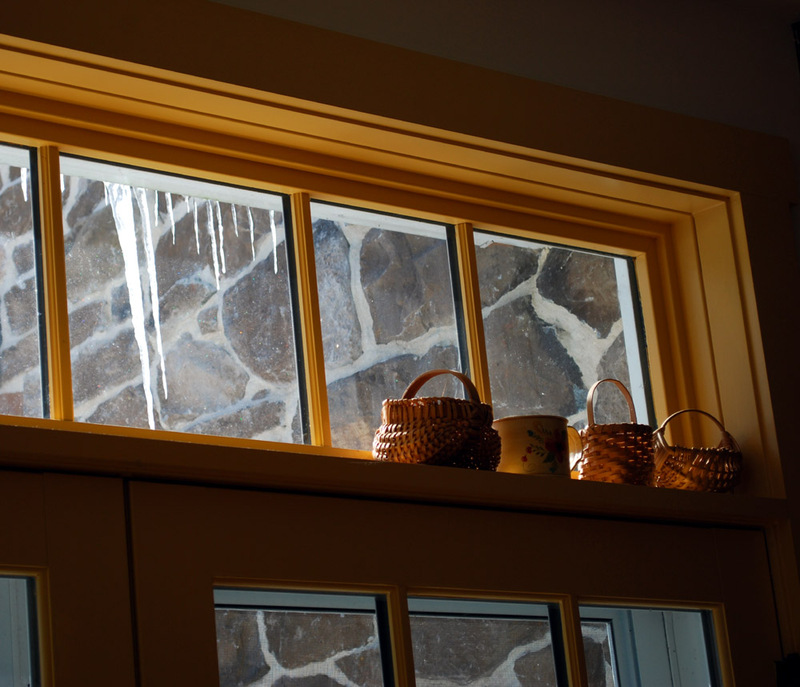 Saville is well-to-do and New-England-educated. Finishing his education in France, he was impressed with the ideas of secular humanism enough to become an atheist. If man is the center of all things than Christianity is superstition. Vera’s faith is strong. Her principles stand in contrast to Saville’s. I grew impatient as hardships intensified. But I am often impatient when a novel is compelling and conflict resolution seems uncomfortably far off. The happy ending, however, is worth the wait. 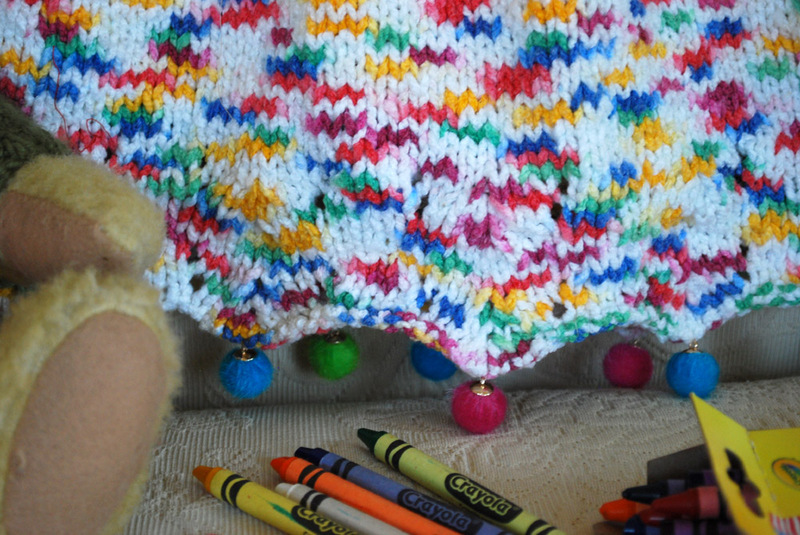 The pom-poms are an afterthought - needed to stop the scalloped hem from rolling. Eloise likes them. Admittedly, E. P. Roe created this novel to be lamppost for doing right. Those who strive to walk the narrow road of a Christian (serving the God of the Bible above self-gratification) will find encouragement here. Near to Nature’s Heart is quality for high school. I wish I knew about it when collecting books for my children back in the day. 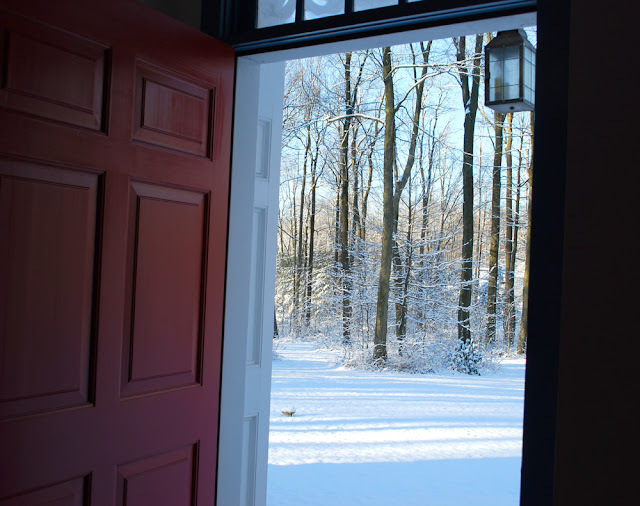 Over the winter I looked up other stories by E. P. Roe, putting 3 FREE on my Kindle. Near to Nature’s Heart was unavailable then. This week I see it is newly available (for a small price.) How wonderful that someone decided to preserve this “complete stranger” from obscurity. This next story by E. P. Roe is easy reading. It’s darling. I gobbled it up. Originally, Driven Back to Eden was a fireside read for the whole family, I suspect, because it first appeared in the St. Nicholas Magazine, probably in serial form. (Its editor, Mary Maples Dodge, is best known for “Over the River and Through the Woods”). I live in Eden Township so this might have been why I took notice of the title. She is rarely without a baby doll. Why is this story darling? Why did I read it twice? Driven Back to Eden is told by the father of the story, in first person. He, his wife, and 4 children live in a crowded tenement in New York City in the 1880s (when written.) Basic bills are paid but Father finds his job dead-end. His children are no longer little ones, and the “flat” and the city street are suffocating them slowly-but-surely. The first chapter is amusing but telling. Father, just home from work, does a favor for Mother (whose complexion has become gray of late.) He looks for his children to call them in for supper. He finds 3 of the 4 in the middle of precarious situations involving peers. Father’s eyes open. That evening he secretly and soberly appraises things. He is determined to make some sort of change for the better. But what? That very night Father’s mind is made up as Mother is willing to give her husband’s big “change” a try. Great. It’s settled then. He gets his children excited about moving to the country. Agricultural books are their Christmas presents. Come spring the flat is sold and they inhabit an old farm house up the Hudson River. Almost immediately Mother, and the whole family, flourish in the fresh air of their new surroundings, although they certainly have their work cut out for them. The hours of farm chores the children must do would be controversial today, yet the work is light enough. (Growing raspberries is described in detail.) And the children enjoy playful afternoons and exploration in nature. When Mother’s plain country food is served, they lick the platters clean (figuratively). Color comes to cheeks. Eyes sparkle. Icicles over the kitchen door. Even if horticulture, with its fast-growing weeds, applications of manure, hoeing, haying, hewing, and plain food, isn’t normally your choice of subjects, something vibrant will touch you in Driven Back to Eden; that something will be love. Also, free on Kindle is E. P. Roe’s He Fell in Love with His Wife. Although, right off the bat, the title is a give-away, the first chapters are gloomy. I thought, “This isn’t my cup of tea.” The main character is a 1880s farmer, depressed and numb. He isn’t a likable man, I thought. To add to this, conflict increases by characters who are lazy, dishonest, or given to drink. I almost closed the book in disgust. 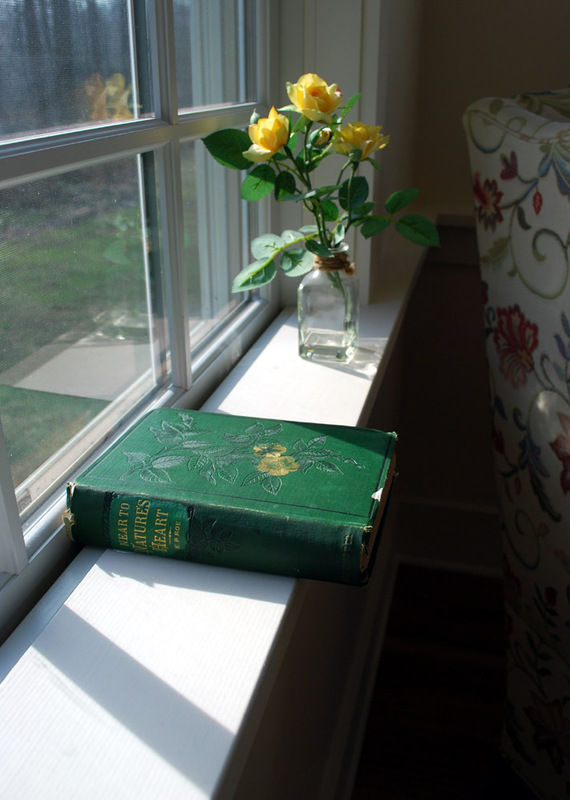 But a dawn of pity lighted the horizon, like the misty pink of a winter’s morning, so I kept reading. Snow out our front door. Pity for a character (down in her luck) ushers in gentleness and gratitude. These qualities aren't static. They're alive. Pity is love in the bud. It blossoms into something bigger in the spiritual life of the soul when fed. We can sink in the mire or go numb when faced with relentless loneliness, darkness and difficulty. But we hang onto hope, carry hope on the wings of right living. Then, we trust God for the journey of flight. 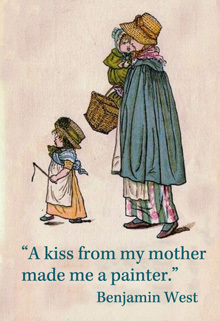 And with these examples of realistic fiction from the 19th century Christian viewpoint, I wish you a Happy Valentine's Day. Simply Charlotte Mason will absorb the cost of postage when 4 copies of Mother Culture are mailed to one (U.S.A.) address. 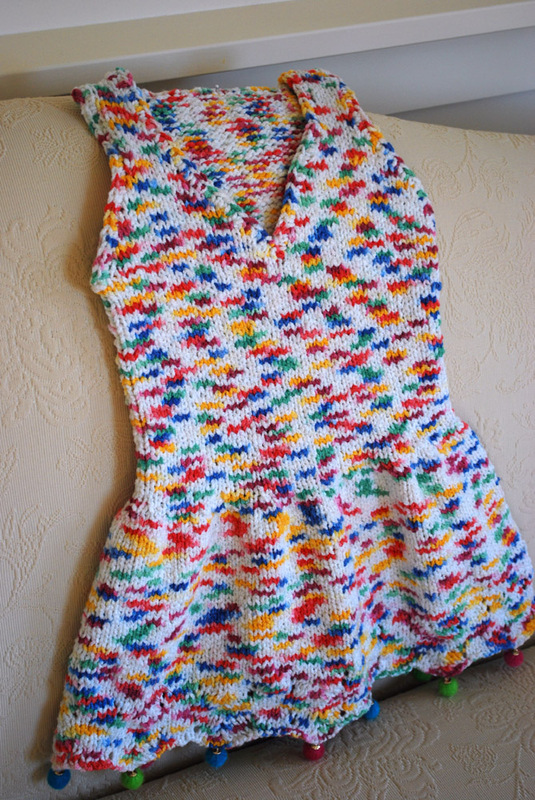 A small group could take advantage of this FREE postage. Will Mother Culture be on Amazon? Eventually, I hope. Will any of my books be on Kindle? Eventually, I hope. Business riga-ma-role is going on behind the scenes. 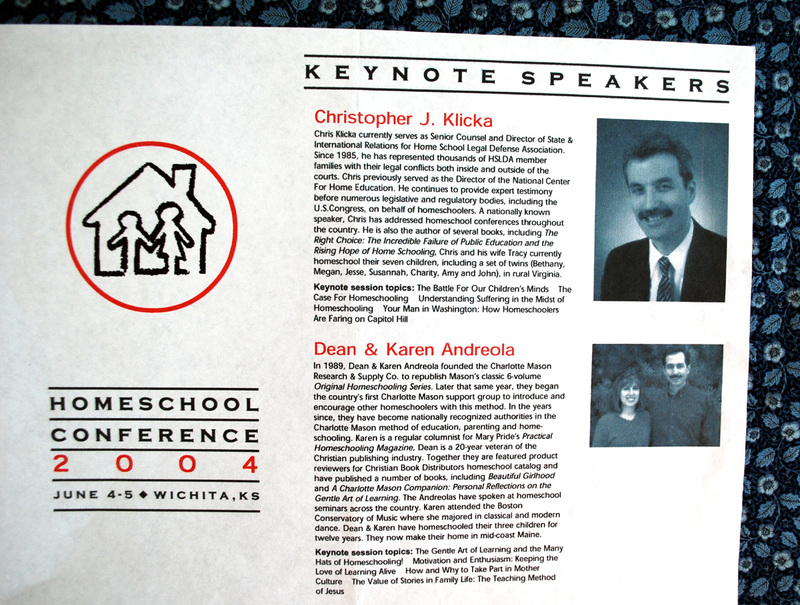 Karen's book has inspired "the educational life" in families since 1998. $5.00 Check or PAY PAL Free shipping in the U.S.A. Click CD for info. Copyright, All Rights Reserved, Charlotte Mason Research Co.. Powered by Blogger.